The Atlantic Puffin (Fratercula arctica), affectionately called, "The Flying Potato" by Newfoundland natives, has been nicknamed, "sea parrot" because of its bright, oversized beak. Interestingly, the brilliant color of this sea bird's beak fades to a drab gray during winter months. Puffins live the majority of their lives in the water. They can be seen resting on the waves or swimming by using their wings in a flying motion underwater. They have webbed feet for superb steering and diving, with the ability to go as deep as 200 feet if needed. On the other hand, on land they are clumsy at best. Though they can fly up to 55 mph once airborne, their landings seem more like a semi-controlled crash, with them often flying a few feet in the air before tucking in their wings and just falling to the ground. 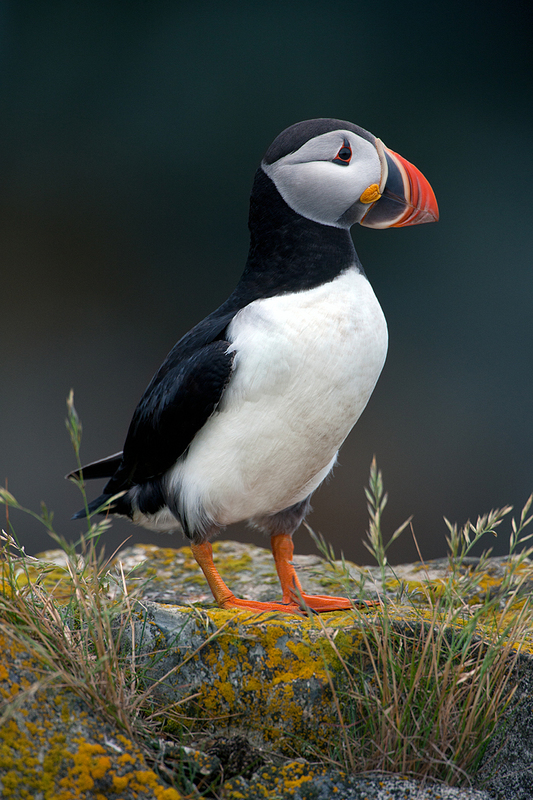 This puffin, filmed in Newfoundland, was content to pose for the camera, proudly showing off his 10" high stature. They appear to be very proud birds, strutting with their chests inflated and puffed out, as if they are of some great importance. These are magnificent birds with personality to spare.